I feel like when September hits, it's easy to throw the idea of summer produce out for all the fall goodness that's about to come our way. And yet, I find September to be one of the best months for tomatoes. The mature plants are still producing and the abundance is still there. The change in the weather also makes me a bit more mindful that it's only a short time before the tomato bounty is gone. This harissa tomato salad is a stunner side-dish or lunch salad. I make a note of this in the recipe but I also feel it's important to call it out here. Make the harissa and farro ahead of time and use both throughout the week. Toss the farro into your morning eggs, use as the base for a grain bowl or more salads, or have a breakfast-for-dinner night and make this farro skillet. As for the harissa, it's great with grain bowls, roasted vegetables, or made into another sauce. My favorite is to swirl green harissa into a cashew cream. It makes for the perfect balance of smooth and spicy. 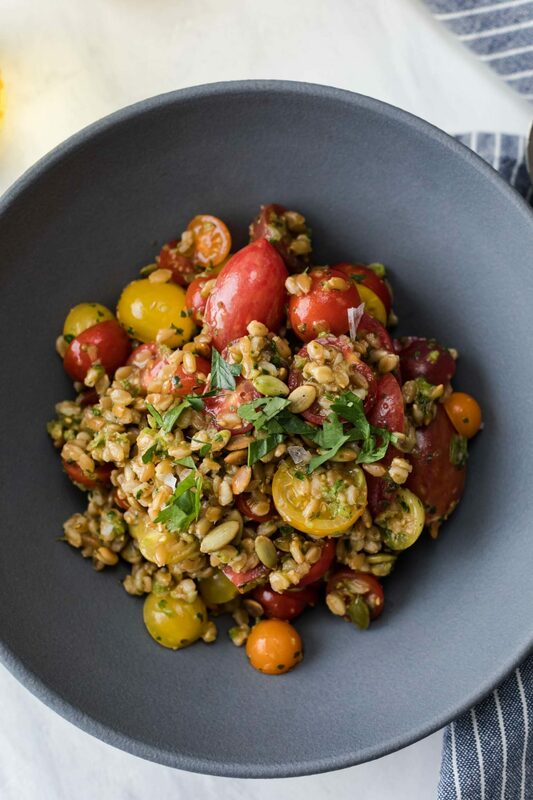 The post Harissa Tomato Salad with Farro appeared first on Naturally Ella.